Elijah Cummings is a Democratic member of the United States House of Representatives, representing the 7th district of Maryland. He is married to Maya Rockeymoore. Congressman Elijah Cummings was born and raised in Baltimore, Maryland, where he still resides today. He obtained his Bachelor’s Degree in Political Science from Howard University, serving as Student Government President and graduating Phi Beta Kappa, and then graduated from the University of Maryland School of Law. Congressman Cummings serves on numerous boards and commissions. He is spearheading an effort to strengthen the Maritime curriculum at the Maritime Academy in Baltimore. He is the Chairman of the Maritime for Primary and Secondary Education Coalition (MPSEC). He also serves on the U.S. Naval Academy Board of Visitors, the Morgan State University Board of Regents, the Baltimore Aquarium Board of Trustees, and the Baltimore Area Council of the Boy Scouts of America Board of Directors. He is an honorary Board member of the SEED School of Maryland, KIPP Baltimore Schools, and the Baltimore School for the Arts. At former Maryland Congressman Parren Mitchell's funeral service in July 2007 delivered a fiery eulogy, praising Mitchell as a mentor and a friend who guided and inspired him throughout his career. He began his career of public service in the Maryland House of Delegates, where he served for sixteen years and became the first African American in Maryland history to be named Speaker Pro Tem. Since 1996, Congressman Cummings has proudly represented Maryland’s 7th Congressional District in the U.S. House of Representatives. Congressman Cummings currently serves as the Ranking Member of the Committee on Oversight and Government Reform. As the main investigative committee in the House of Representatives, Oversight and Government Reform has jurisdiction to investigate any federal program and any matter with federal policy implications. As the Committee’s Ranking Member, Congressman Cummings fights to hold the Presidential Administration to a high standard of excellence and to ensure efficiency and effectiveness in the actions of the government of the United States. He also seeks to identify appropriate reforms that prevent waste, fraud and abuse and that ensure government programs meet the needs of the American people. Congressman Cummings is also a senior member of the House Committee on Transportation and Infrastructure, serving on both the Subcommitte on Coast Guard and Maritime Transport and the Subcommittee on Highways and Transit. On Saturday, January 19, 2001, Progressive Maryland and the Campaign for America's Future co-sponsored an event — The Working Families Legislative Conference — designed to link local Maryland issues with a national progressive agenda. The conference will focus on key local and national issues including: Affordable Housing, Health Care, Living Wage, Public Financing of Campaigns, and Afterschool Programs. The conference took place at Martin’s Crosswinds, 7400 Greenway Center, Greenbelt, MD from 11:00 AM to 4:00 PM. Speakers listed included Lieutenant Governor Kathleen Kennedy Townsend (likely), Congressman Ben Cardin, Congressman Elijah Cummings (likely), Robert Borosage, from the Campaign for America's Future, State Senator Chris Van Hollen, Delegate Mark Shriver, and Delegate John Hurson. The Working Families Legislative Conference was part of a series of regionally based Next Agenda conferences, "representing a new kind of partnership between CAF and state-level progressive organizations — unity coalitions which are coming together around a progressive action agenda for their state and for the nation". “We must organize at the grassroots, build power in localities and states, and create in theses ‘laboratories of democracy’ the formula for economic success in Washington, DC.” said Sean Dobson, one of the leaders of Progressive Maryland. Signatories included Rep. Elijah E. Cummings. On September 3, 2003 Congresswoman Barbara Lee (D-CA) introduced H.R. 3000, the United States Universal Health Service Act, which would provide health coverage for all Americans. H.R. 3000 would establish a United States Health Service (USHS), which would eliminate profit issues from health care because it would be owned and controlled by the public and administered primarily at the local level. According to the Communist Party USA's People's World, initial supporters of HR 3000 were Julia Carson, (D-Ind. ), Donna Christensen (D-Va.), John Conyers (D-Mich.), Elijah Cummings (D-Md. ), Danny Davis (D-Ill.), Jesse Jackson, Jr. (D-Ill.), Dennis Kucinich (D-Ohio), Major Owens (D-N.Y.), Donald Payne (D-N.J.), and Lynn Woolsey (D-Calif.). We will not win the United States Health Service without a massive, prolonged struggle by working people against the corporate defenders of the current for-profit health care industry. The National Conference/Dialogue on the Sudan will take place (Feb 27th), culminating a week long observance for an Afro-American Muslim leader who was (and still is) most deserving. We expect to be joined by a host of local grass-roots community leaders and activists (and possibly a few from outside the Washington area) for the press conference. Our hope is that we will also be joined by leaders from some of our “major Muslim organizations” (i.e., CAIR, ISNA, ICNA, MAS, MPAC, etc), as this will be an opportunity for us to make a unified statement of concern and support for the Sudan and its people – particularly in light of the crisis in Darfur. The objective will be threefold: (a) enlightened dialogue on the crisis in Sudan; (b) education for the community; (c) and a far more constructive engagement of African Americans on this issue than what we’ve seen thus far. This conference is being sponsored by The Committee for Truth, Justice, and Reconciliation in the Sudan (a project of The Peace And Justice Foundation). Elijah E. Cummings signed the letter. More than 1,000 people turned out November 2006 at the Council on American-Islamic Relations (CAIR) banquet in Arlington, Va., to hear addresses by several elected officials, including Keith Ellison, the first Muslim in Congress. The event raised more than $620,000 to support CAIR's civil rights and advocacy work on behalf of the American Muslim community. Elected officials who spoke at the sold-out event included Representative-elect Ellison (D-MN), as well as Reps. Mike Honda (D-CA), Sheila Jackson Lee (D-TX) and Albert Wynn (D-MD). Ellison and Jackson Lee offered their addresses by video. Saqib Ali, who was elected to the Maryland House of Delegates (District 39) on November 7, was also in attendance. Other speakers included Special Agent in Charge Joseph Persichini, Jr. of the FBI's Washington Field Office, Fairfax County Police Chief Col. David M. Rohrer and Amy Goodman of Democracy Now. Most members of CAIR's national board also took part in the banquet, which was emceed by Julia Shearson of CAIR-Ohio's Cleveland office. Several Muslim community members received CAIR Islamic Community Service Awards during the dinner. The annual CAIR Rosa Parks Civil Liberties Scholarship went to Raashida Muhammad of Stillman College. Also speaking were Reps. Elijah Cummings , CAIR National Board chairman Parvez Ahmed, and executive director Nihad Awad. All praised CAIR for its dozen years of working to endorse, lobby and educate the American public and the country's leaders on the positive aspects of Islam and Muslims in America. Rep. Elijah E. Cummings (D-Md.) (October 2017). The bill—sponsored by US Reps. Peter DeFazio(D-Ore.), Marcy Kaptur (D-Ohio), Robert Scott (D-Va.), Elijah Cummings and Donna Edwards (both D-Md. ), Lloyd Doggett (D-Texas), Mazie Hirono (D-Hawaii) and Rush Holt, Jr.,(D NJ) —would change the way securities are valued, applying “an economic value standard to measure the capital of financial institutions,” as opposed to a market standard, an increase in the federal deposit insurance maximum and other accounting measures designed to create breathing room. It also would require the Federal Deposit Insurance Corporation to purchase certificates that would be repaid. “What I’m proposing is to use both market discipline and regulatory functions at virtually no cost to taxpayers to unclog the arteries of commerce so banks can begin lending again,’’ DeFazio said, according to The Oregonian. As of February 20 2009 Elijah Cummings was listed as a member of the Congressional Progressive Caucus. 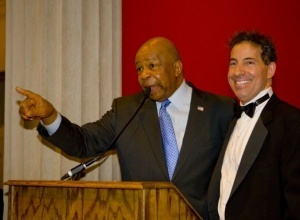 Congressman Elijah Cummings and Attorney General Doug Gansler Co-Chairs of Maryland for Obama, hosted an " extraordinary gala event for Senator Jamie Raskin, Chair of Montgomery County for Obama at the Corcoran Gallery of Art, Friday, January 9, 2009 - 8:00 pm. HR 365 was introduced by Michigan Democratic Rep. Hansen Clarke, in 2011, in a YouTube video posted on the representative's page, he said "We need to cut, cap, and forgive student loan debt," and that "That is the true debt that is burdening American families. We cut student loan debt we'll have a freer more prosperous country." The bill has been sponsored by House Representatives Dennis Kucinich of Ohio, Keith Ellison of Minnesota John Conyers of Michigan, and Elijah Cummings of Maryland. First, registration begins at 8:00 a.m. at the parking lot of St. William of York Roman Catholic Parish on Cook’s Lane, near the corner of Edmondson. FREE T-SHIRTS for the first 200 attendees (courtesy of Amalgamated Transit Union Local 1300–Thank you!). We are encouraging everyone to wear red (a liturgical color indicating a movement of the spirit–and the color of the Red Line light rail transit line. Third, we’ll walk together to our first “site,” the Westside Skill Center. We’ll actually convene in the Edmondson Village Shopping Center across the street (4530 Edmondson) and hear from Rep. Elijah Cummings, who has promised to be our “Jobs Champion” in the United States Congress. I met with Rep. Cummings this week with a group of our team from the ATU, the Jobs Opportunities Task Force, CASA de Maryland, Building ONE America and our own organization BRIDGE Maryland. Our half hour together stretched on and on until his staff dragged him from the room to his next appointments! Clearly, we hit a sympathetic nerve; and Saturday’s event will be energy packed! Baltimore Young Communist League leader Jordan Farrar was involved with Barack Obama’s Organizing for America and he served on the committee which organized a rally on October 23, 2009, at the Senator Theater, Baltimore, for OFA to support President Obama’s health care bill. A dozen speakers, including Congressman Elijah Cummings, Maryland AFL-CIO president Fred Mason and Baltimore NAACP president "Doc" Cheatham, called on Congress to act now. In her remarks, event organizer, Communist Party USA member Caroli Mullen targeted "moderate" Congress people who were sitting on the fence, telling the audience that "Democrats better get some spine,"
According to Mullen, reform must be based on the premise that health care is a right, not a privilege. Mullen told the World how the event was conceived. "We were literally sitting around the kitchen talking about how the 'tea-baggers' were getting publicity by disrupting town hall meetings. The media was ignoring the majority of us who favor reform. We needed to stage a public event to let Congress know Baltimore supported a public option." Mullen said that while she supports a public option, a single-payer system was the best way to provide comprehensive, universal care. Congressman Cummings pointed out that two Maryland companies - BlueCross-BlueShield and United Heathcare, control 80% of the private health care market. Cummings said "what good is having choice if you can't afford it? A public option gives us real choice because it will bring down costs." On Jan. 27, 2010, U.S. Representatives Keith Ellison and Jim McDermott led 52 other members of Congress in signing a letter addressed to President Barack Obama, calling for him to use diplomatic pressure to resolve the blockade affecting Gaza. Elijah E. Cummings was one of the signatories of the letter. The entire letter together with a complete list of signatories can be read by clicking here. On July 28, 2010, Congresswoman Barbara Lee, Congressman Elijah Cummings and former "Green Jobs Czar", Van Jones spoke about the future of American politics at the kick-off event for 21st Century Democrats' 2010 Youth Leadership Speaker Series. The event was sponsored by Representative John Lewis and Senator Tom Harkin. 21st Century Democrats is led by one-time DSAer, Jim Scheibel. Elijah Cummings for Congress has been a client of Robert Creamer's Strategic Consulting Group. According to a 2011 report, twenty-five of the 100 highest paid US CEOs earned more last year than their companies paid in federal income tax, a pay study said on Wednesday. At a time when lawmakers are facing tough choices in a quest to slash the national debt, the report from the Institute for Policy Studies , a "left-leaning Washington think tank, quickly hit a nerve". Members of the Host Committee included Elijah Cummings. In 2013 Progressive Democrats of America assigned activists to deliver their material to almost every US Congressman and several Senators. Rolande Glicenstein, was assigned as contact for Rep. Cummings. In June it was David Obi. On Jan. 31, 2013, at the Night of Peace Family Shelter in Baltimore, CITGO Petroleum Corp. President and CEO Alejandro Granado and Citizens Energy Corp. Chairman Joseph P. Kennedy II launched the eighth annual CITGO-Venezuela Heating Oil Program with the first heating oil delivery of this winter’s initiative. The program, which began as a single donation in 2005 in response to the high prices of heating oil resulting from hurricanes Katrina and Rita, has grown well beyond its original scope. Today, it has become a humanitarian symbol of unity between the people of Venezuela and those in need in the United States. Congressman Elijah Cummings of Maryland, who also spoke during the event, reiterated the importance of helping those in need. “I commend CITGO and Citizens Energy Corp. for launching the Heating Oil Program this year. This program is literally life-saving for so many whose resources are already stretched thin in tough economic times. I stand with the many Baltimore and Washington recipients who thank both CITGO and Citizens for their commitment to helping our communities,” he said. Echoing those sentiments, Venezuela’s Vice Minister of Foreign Affairs for North America Claudia Salerno Caldera addressed the plight of poor people and why humanitarian assistance is so vital. “The vision of social responsibility in the energy policy of the Bolivarian Republic of Venezuela has allowed us to assure that our profits benefit the neediest people in our country. Just as the government of President Hugo Chávez has made significant efforts in the fight against poverty and in the promotion of social justice in Venezuela, this program demonstrates that our commitment to the poor transcends all boundaries, ideological and geographical,” Salerno said. The Alliance for Retired Americans Political Action Fund endorsed Elijah E. Cummings in 2014, also 2012. September 2015, D.C.'s Convention Center was the site for the Congressional Black Caucus Foundation's 45th Annual Legislative Conference where the development of the #BlackLivesMatter movement was given intense attention from many different perspectives. More than 70 education, health, civic engagement and economic empowerment sessions under the theme, "With Liberty and Justice for All?" filled September 16-20 during the day as concerts, receptions and networking gatherings filled the evenings. Thursday's first event was the National Town Hall: "Black Lives Matter-Ending Racial Profiling, Police Brutality and Mass Incarceration." Roland Martin, Managing Editor of TVOne NewsOne Now moderated a panel which included Congressional Representatives Elijah Cummings, Sheila Jackson Lee, Hakeem Jeffries, and G.K. Butterfield. Others on the panel included Alicia Garza, co-founder of the Black Lives Matter Network (#BLM); Alphonso Mayfield, president of the SEIU Florida Public Service Union; and Val Demings, former police chief of Orlando, Fla., the first woman to hold the position. Roland Martin reminded the audience that while 24 criminal justice reform bills have been passed since the killing of Michael Brown in Ferguson, Mo., no action has yet been taken by the prosecutor in Cleveland one year after Tamir Rice was gunned down. Ms. Garza underscored that the criminal justice system as currently instituted "is not broken; it is designed to work just as it does work." And Rep. Hakeem Jeffries from Brooklyn, N.Y. declared, "Black men are viewed as economic commodities. Democrats and Republicans built a prison industrial complex and then filled it through mass incarceration." The People's World was represented at the conference by participants from DC, Daytona Beach, St. Louis and Baltimore. We learned that the Department of Justice (DOJ) has met with #BLM about strengthening accountability mechanisms within police departments, but that the DOJ has put on record that their mandates at a local level are "too high." Elijah Cummings praised Marilyn Mosby, Baltimore's elected prosecutor for her bravery in pursuing legal remedies in the Freddie Gray police murder trials. "We want to be sure that the wheels of justice turn and are not stopped," he said. Moderator Roland Martin encouraged voting as the answer to racism in the criminal 'injustice' system, since so many District Attorneys are elected. "Having a Black DA matters, but that doesn't happen if Black folks don't vote." Martin said that as a result of a new DA in one district, there have been more innocent African Americans freed in one year than in the 20 previous years. Alicia Garza said that it is a requirement for activists to fight for "the right of Black people to live in our full dignity and our full humanity," at every level, including in federal, state and local government. In terms of police departments, she said that Black and progressive police are fighting police injustice from within, attempting to change a culture of racism and 'police loyalty' and replace it with police integrity. What was clear from the panel discussion was that the Congressional Black Caucus strongly supports the Black Lives Matter Network in the work it is doing. Congresswoman Sheila Jackson Lee stated, "I'm proud that we the CBC have had the wisdom to follow Black Lives Matter. It engenders a diverse, generational movement. As we do the policy, I believe Black Lives Matter can be the catalyst-like the movement that brought about voting and civil rights legislation in the '60s." During Q & A, the first question to the panel at the Town Hall was that Black on Black violence had not been addressed. Garza's answer was that people will reach for power, whether it be against their neighbor or against the real forces keeping them down. Other panelists answered that white on white crime is also greater than interracial violent crimes. Collective bargaining, stated one member of the audience, can act as a bar to getting police accountability. Mayfield of the SEIU offered that contract negotiations are with City governments and thus can be influenced by citizens. He countered other panelists, declaring that police can be suspended without pay for misconduct under some contracts. Other questions resulted in the panel talking about widening the struggle to include the right to a good education and creating the labor force to fill the 1.4 new technical jobs that will be needed in the next five years. By February 20 2019 endorsers of Alexandria Ocasio-Cortez's HR 109 (Green New Deal) included Elijah E. Cummings. ↑ http://cummings.house.gov/about/biography.shtml. Official Bio. Accessed 8/8/11. This page was last modified on 18 February 2019, at 00:43.